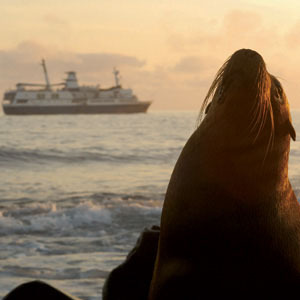 Fantastic treasures await you on this river cruise vacation to Peru and the Galápagos Islands. Enjoy a walking tour of Lima; guided sightseeing in Quito, where you can have your photo taken at the "Center of the World," and also in Cusco, the former capital of the Inca Empire; and an excursion to Otavalo’s famous Indian market, where you can shop for beautiful textiles, artwork, and other unique souvenirs. Also, visit the fascinating Inca constructions of ancient Puca Pucara, which translates to "Red Fortress," the magnificent Temple of Sacsayhuaman, which overlooks the city of Cusco, the Inca fortress of Ollantaytambo, and mystical Machu Picchu. 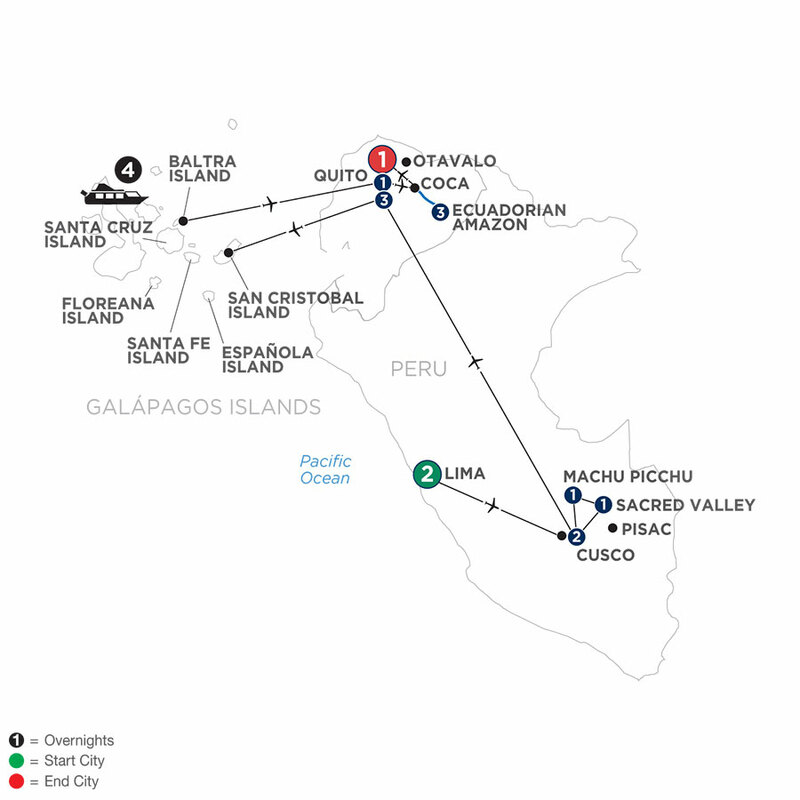 Then, fly to San Cristobal Island for a fantastic 4-night Galápagos Islands cruise onboard the recently refurbished Treasure of Galápagos. In the company of a local Naturalist, you’ll encounter indigenous plants and animals found only in the Galápagos Islands, such as giant tortoises, Galápagos fur sea lions, and marine iguanas-just to name a few. Also, enjoy an amazing opportunity to snorkel in the turquoise waters and see the colorful fish, sea lions, and perhaps a penguin or shark! Next, fly to Coca, where you’ll travel by canoe to your lodge in the Amazon Jungle. Spend three nights here and enjoy a rainforest canopy walk, guided night tour to see the wildlife that comes out at night, cruises through the flooded forest, and spend time with the natives on a visit to a local village and school. Ancient ruins, spectacular scenery, an amazing variety of animals in their natural environment, and historic buildings-this cruise vacation has it all! 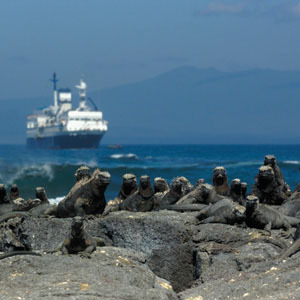 Seeing the Galápagos Islands on board the 9-suite Treasure of Galápagos goes beyond traditional cruising and allows you a truly intimate experience with a maximum of 16 guests. Chartered exclusively for Avalon guests, the Treasure of Galápagos features spacious suites with balconies and takes you around the archipelago to explore the natural wonders of the region in privacy and comfort. Completely refurbished in October 2017, the Treasure of Galápagos is built to luxurious standards and features an elegant yet relaxed atmosphere, allowing guests to enjoy all that the Galápagos is famous for intimate contact with the wildlife! Delve into this unique world with the Treasure of Galápagos' crew and expert Naturalist, who shares their passion for nature and conservation of this mysterious part of the world. The Treasure of Galápagos' non-smoking interior features elegantly appointed common areas including an indoor lounge & bar, dining area, shaded outdoor lounge, sun deck with Jacuzzi, and an observation area for whale or dolphin watching. Each of the seven outside suites offers a private balcony, which is rare in the Galápagos, air-conditioning, private bathroom, hairdryer, and safe. In addition, the 430 square-foot Master Suite boasts two private balconies as well as a private living area.